The EU’s failure to secure an Association Agreement with Ukraine and the stormy events that followed show nothing less than cracks in the very substance of the Union. They suggest that, perhaps more than ever, the EU is in danger of turning into a mechanic bundle of grandiose empty slogans and austerity-driven market expansionism. Ukraine, we are told, faces a “civilizational choice” between Europe and Russia, between West and East. A dilemma that combines the epicness of upholding world-historical values with the easiness of a no-brainer. Such talk occludes the plain fact that Ukrainian leaders had to decide on a treaty that is economic in its nature. But it also works toward flaring up divisions within an already diverse society, creating an unneeded confrontation with Russia, and cementing the EU’s attitude of self-complacency. As such it is both detrimental to Ukraine and subversive of the EU’s potential to re-imagine itself. A brief glimpse over the past few centuries paints the picture of Ukraine as a territory of strife amongst foreign forces. The EU’s Eastern Partnership is as if on purpose designed to contain reminiscences of those times. The countries that spearheaded the initiative – Poland and Sweden – have a historical record as Russia’s competitors for dominance over north-eastern Europe. The Association Agreement with Ukraine was to be signed in Vilnius during Lithuania’s rotational EU Presidency. In the mid-17th century, hetman Bohdan Khmelnytsky led a successful revolt against the Polish-Lithuanian Commonwealth to create an independent Ukraine – but then decided it would be wiser to unite with Moscow. In this light a signing of the Association Agreement could be easily framed as a reversal of that historic choice. The handful of historical allusions will lose any air of far-fetchedness once we recall a brute fact that cannot be over-repeated: the Ukrainian nation includes two large majorities – Ukrainian speakers of Catholic background in the western part of the country, and Russian speakers of Christian Orthodox background in the east. That this cultural-linguistic diversity can translate in an internal west-east divide is plain upon viewing the election result maps from the past decade or so. And, according to some commentators, upon an analysis of industry structure in the country. The fact that many eastern Ukrainians are not so ready to turn backs on Russia cannot be explained away by mere economic dependence. Any attempt to frame the issue of EU integration as a “civilizational choice” is parasitic on the potential for internal division in the country. After heating up this rhetoric, EU leaders can only sound hypocritical in their subsequent calls for “national consensus.” And they have to face the embarrassment of seeing members of Ukrainian far-right groups among the most active participants in the massive rallies that came out to fight for the liberal, supra-national European project. Turn to the Association Agreement itself and we see that the EU has little to give Ukraine in return for the extensive process of implementing reforms and adopting EU legislation. The compressed version of the 1,500-page treaty has become more or less transparent in the past weeks. Commentators have remarked that, with the required liberalization of the internal market and the dropping of tariffs, free trade with Europe will in the short term prove devastating for the Ukrainian economy. Something that has been repeatedly stressed by Ukraine’s government. What is more, the treaty envisions funding for reforms not only from EU sources, but also from “international financial institutions.” The Association Agreement came in a loose package with a little-discussed IMF loan-for-reforms program also scrapped by the Ukrainian government as boding economic and social hardship. On the face of it, the treaty is a free trade agreement cloaked with the thin and hollow “bringing Ukraine back to Europe” talk of EU leaders. In the document itself, there is nothing said about Ukraine’s eventual EU membership. 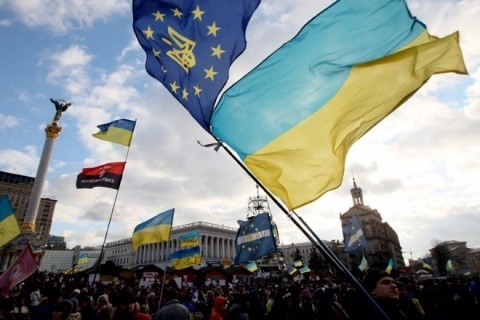 There is little and all too vague said about the free movement of Ukrainians in Europe. The EU itself has committed all to weakly – if at all – to Ukraine’s European future. On the face of it, Ukrainian leaders might be actually doing just what they are saying they are – trying to get better deals from both EU and Russia. Ukraine’s President Viktor Yanukovych met Russian counterpart Vladimir Putin Friday, but PM Azarov’s cabinet has already sent envoys to Brussels to negotiate on revisions of the Association Agreement. However, this far the EU has not proven very cooperative with that desire, to say the least. In the aftermath to the failed Eastern Partnership summit, the EU said it will not take part in trilateral talks including Russia, such as were proposed by the Ukrainian government. The Union appears to have adopted precisely the bullying tactics that they are accusing Russia of. But then of course Russia has much better leverage in this domain, given its structural ties with the Ukrainian economy. Of course, EU countries are not always so unwilling to cooperate with Russia. Recall the genesis and completion of the Nord Stream natural gas pipeline. Unlike currently developed South Stream, this brainchild of Germany and Russia was granted an exemption from the EU’s Third Energy Package as being of strategic importance for Europe (given that it circumvents… Ukraine). Protests in Ukraine are currently taking a broader agenda, expressing people’s ire not only at the scrapping of the EU Association Agreement, but also at what is perceived as the corrupt, self-serving approach of the Ukrainian political elite. But Ukrainians need to know that EU politicians can be just as pragmatic. And EU leaders and citizens, on their part, must invest efforts in articulating a more coherent and inspiring vision of Europe.